Henry “Skip” Meier, P.E. 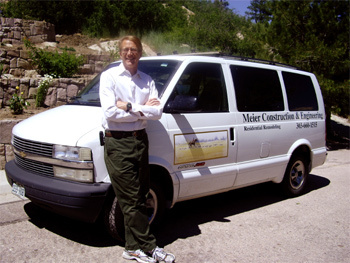 is the Owner and President of Meier Construction and Engineering Company. He holds a Bachelor of Civil Engineering from the University of Delaware, and is a registered Professional Engineer in the State of Colorado. Before starting the company in 1998, Skip spent 20 years as a professional consulting engineer. He obtained valuable Project Management skills related to client satisfaction, contracting, coordination of multiple subcontractors, and the preparation and execution of detailed scopes of work involving both professionals and tradespeople. These skills have been invaluable in assuring successful remodeling projects. Since 1998, Skip’s professional engineering and construction background has set him apart from many contractors. This background has been augmented by detailed, daily, hands-on experience in managing complex, multi-trade projects within the homes of our clients. Many of our clients are busy, successful professionals who appreciate the value of good listening, speaking, writing, and computer skills. Since 1998 Skip has grown professionally through the design and completion of increasingly complex remodeling and new home construction projects. From humble beginnings managing multiple basement finishes, Skip has grown to managing large remodels ($200K - $700K) and also new home construction. Skip has personally managed the construction of a $600K home on 35 acres in 2004, and constructed a $1 million spec home in Denver in 2005. Skip has also designed numerous remodels, as well as the new home constructed in 2005, as a design-build contract.